One of the most important battles in the Revolutionary War. Plan of the Siege of Charleston in S. Carolina. This is a rare plan of the Revolutionary War Siege of Charleston, South Carolina, issued for John Marshall's 1832 edition of the Life of Washington. The map covers Charleston Harbor and parts of the Cooper and Ashley Rivers from Sullivan's Island and James Island to the Ship Yard (roughly where Magnolia, St. Lawrence, and Bethany Cemeteries are today). The estates of various important landowners are noted. Color coding indications the positions of British forces as they blockaded both land and sea access to Charleston. 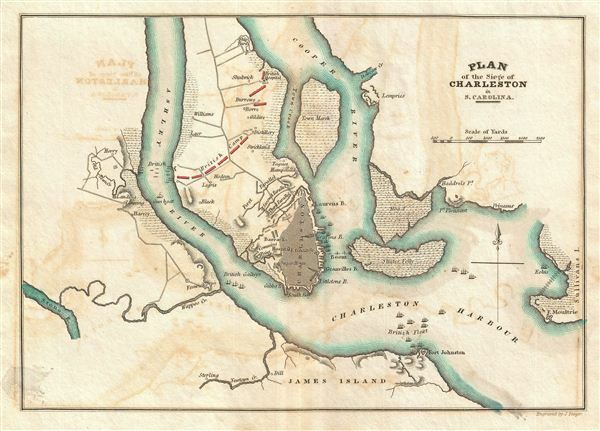 The Siege of Charleston was one of the major battles of the American Revolutionary War. Towards the end of the War, having suffered major losses in the Northern Colonies, the British began to shift their strategic attention towards the American Southern Colonies. After about six weeks of siege, Continental Army Major General Benjamin Lincoln surrendered forces numbering about 5,000 to the British. It was the biggest loss of troops suffered by the Continental Army in the war. The British subsequently remained in control of Charleston until leveraged out by the imminent signing of the Treaty of Paris in 1782. This map appeared in atlas volume attached to the 1832 edition of John Marshall's seminal work, The Life of Washington. Marshall composed the five volume biography between 1805 and 1807 and based the work on original papers and records provided by the president's own family. The earliest partial edition of the The Life of Washington appeared in 1824 as A History of the American Colonies. In 1832 Marshall revised and abridged the original work voluminous to just two volumes and some 400 pages – from which this map was extracted. The maps of the 1832 edition are notable and desirable in that, unlike the original edition, most had hand applied color work. Rumsey 2559.010 (1807 edition). Howes, W., U.S.iana (1650-1950): A Selective Bibliography in which are Described 11,620 Uncommon and Siginficant Books Relating to the Continental Portion of the United States, M317.